Roger Carroll, owner of Cowtown Graphics & Signs, recently completed a big project for the Irving Independent School District. 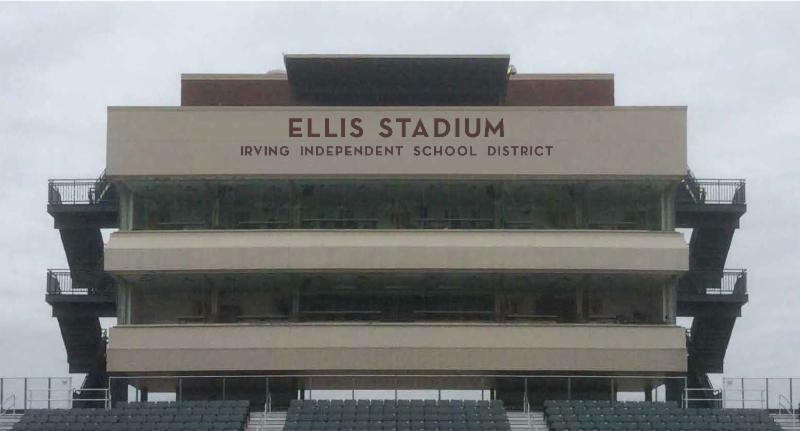 When the Irving IDS wanted to rename their football stadium after their most generous donors, Cowtown was ready to help. Their history of professionalism, quality work, tenacious spirit and work ethic won them the bid. The project proved to be challenging for Cowtown, as they never have done such a large project. They needed to get proper access to install the sign and match the paint perfectly, all within a short time frame. Due to the placement of the sign, Roger’s team had to rent a swing stage to install the new sign properly. The building had also been weathered quite a bit, so Cowtown needed to re-paint the facade to match the existing color, which was extremely challenging. Cowtown was able to complete the project on time and Irving ISD was thrilled with the result.